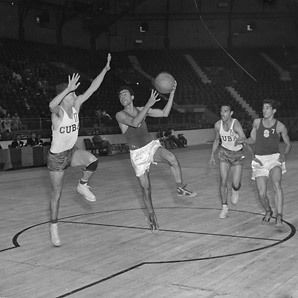 Fereidoun Esfandiary played basketball in the Olympic Games for Iran in 1948, but it was only a footnote to a much larger life. The son of Iranian diplomats, he was born in Belgium and lived in 17 countries as a child. From 1952-54 he served on the United Nations’ Conciliation Commission for Palestine. During the 1960s he wrote several works of fiction, notably The Day of Sacrifice, The Beggar, and Identity Card. In 1970, Esfandiary legally changed his name to FM-2030. He did it because he expected to live to be 100, in 2030, and in order to break free of naming conventions that he considered a relic of humankind’s tribalistic past. He noted, “The name 2030 reflects my conviction that the years around 2030 will be a magical time. In 2030, we will be ageless and everyone will have an excellent chance to live forever. 2030 is a dream and a goal.” FM-2030 taught at the New School for Social Reseach in Manhattan, UCLA, and Florida International University, and served as a corporate consultant to Lockheed, JC Penney, and Rockwell International.